This statistic displays the share of venture capital backed startups in Europe that reached the next funding round as of 2017. 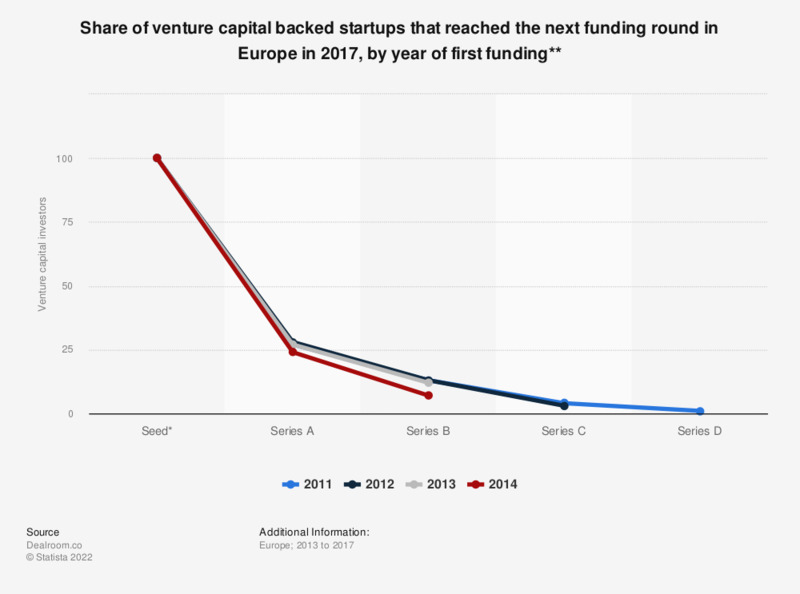 Although it can be seen that even between seed and series A funding the share of startups that continued on to the next round of funding was relatively low. Although this is the case, the figures do not represent companies that failed, as some companies may have become self-sustaining and/or exited. Of startups that first received seed capital in 2011 only one percent made it through to the series D funding round. Of companies that received seed funding in 2014, 24 percent went on to series A as compared to 28 percent of startups from 2012. ** All companies that received VC funding. Not reaching series-A does not mean that company failed. Some companies become self-sustaining and/or exited.